What portion of Democrats say we should amend the Constitution so the candidate who receives the most votes wins? Identify one trend in the data. What is the most important cause of that trend? What is the best explanation for that difference? If Congress votes to amend the Constitution to abolish the Electoral College what portion of U.S. states would have to ratify the Amendment for it to pass? A majority of Americans want to abolish the electoral college. 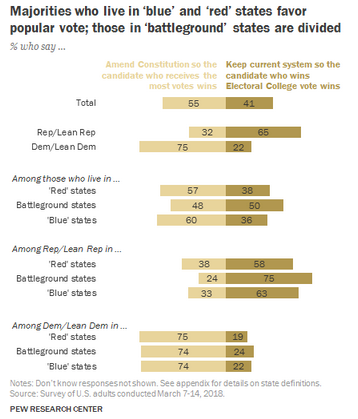 Considering the data from the chart and the difficulties of the Amendment process, do you think it is likely that the U.S. will amend the Constitution to abolish the Electoral College? In what way does the Amendment process reflect federalism? Hypothetically, could we amend the Constitution to abolish the Constitution? The 2000 election and the 2016 election were won by the candidate who got the least popular votes. Did that impact the results of the poll? Would you prefer to amend the Constitution so the candidate who receives the most votes wins, or do you prefer to keep the current system so the candidate who wins the Electoral College vote wins? Based on the data above and what you know about the American political system. In a scenario where Democrats gain a supermajority in the House and the Senate. Describe what Republicans could do to lessen the likelihood of an Amendment to abolish the Electoral College? The Constitution has only been amended 17 times since the ratification of the Bill of Rights in 1791. Make a claim about whether the Framers of the Constitution were more interested in a participatory or a elite democracy. Take ten seconds and draw the electoral college. I know, I know: you aren’t an artist, this isn’t AP Studio Art, You’re hangry. I get it. But really, this will really, Really, Really help you remember the concept of The Electoral College - I promise. Take ten seconds and draw The Electoral College. I’m not going to take this up for a grade, Tweet it to all your friends. Just draw. It can be stick figures, or big blocks and shapes, or totally abstract-it doesn’t matter. Now that you’ve drawn, take a second and look at your masterpiece. That’s it. Really. Now you’ve got The Electoral College in Your long term memory - right where we want it! Thank you for playing. Contact your U.S. House Representative, let them know what you think about the Electoral College, and tell them what you’d like them to do about it?